These results are very interesting. 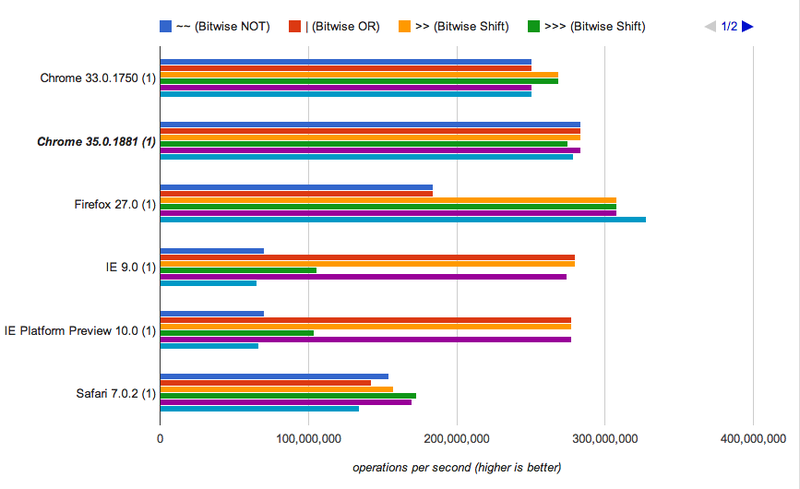 As you can see currently Chrome will handle all of these operations at almost the same speed. However, Internet Explorer handles Math.floor around 76% slower than a bitwise shift/or. Surprisingly Safari 7 handles all versions in a slow manner, with the triple bitwise shift (>>>) being the fastest. In FireFox Math.floor has actually been optimised to the fastest but the other methods are still very close behind. Taking all of this into account, I would suggest using a regular bitwise shift >> as this is fast in all browsers, including Internet Explorer. So ultimately you must make the choice of which operation to use based on your application, the audience you have and the actual routine you are implementing. Meaning, it's best not to confuse the next programmer who comes along so Math.floor is best in non performance critical code but (5 * x) << 0; might be a good idea in a performance bottleneck situation such as on an animated <canvas> which runs code in a loop many times per second.